50 meters by 10 lanes, Colorado electronic timing and scoreboard; spacious locker rooms, deck area, and spectator section; continuous warm-up available. The competition course has been certified in accordance with 104.2.2C (4). The copy of such certification is on file with USA Swimming. The depth of the pool at the start end is 14 feet. The depth at the turn end is 8’2” feet. The permanent seating capacity for spectators is 1,200, with an additional 1,000+ temporary seating capacity. In addition there is handicapped seating and elevator access to the spectator stands. 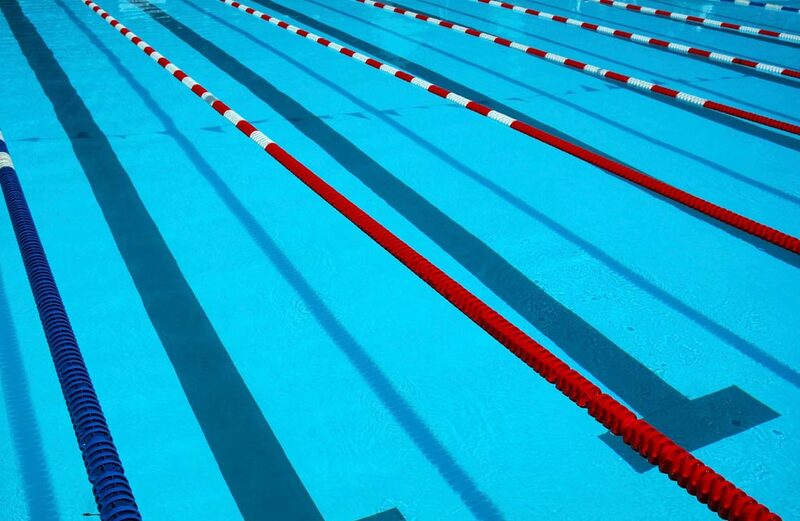 An adjacent 25-yard pool is available for continuous warm-up and warm-down. Men’s and Women’s locker rooms are off the pool deck but are not accessible to parents during the meet. Parents who wish to accompany their children to the locker rooms should utilize the restrooms in the lobby. Colorado timing system and scoreboard are available. Warm-ups will be 4:30-5:15 PM. Meet will begin at 5:20 PM. Morning sessions’ warm-ups will be 7:00 AM with competition starting at 8:20 AM. Warm-ups will be split by team if the average number of swimmers per lane exceeds 30 swimmers per lane, into a minimum of two groups of 40 minutes each. The 45-minute afternoon session warm-up will begin 15 minutes after the conclusion of the morning session. The afternoon warm-up may be split into two 30 minute sessions by team if necessary. Afternoon warm-ups will begin 15 minutes after the conclusion of the morning session. Warm-up for Finals will be 45 minutes. Finals will begin 50 minutes after the start of warm-ups. Estimated timelines and warm-up schedule will be posted on the www.LESD.org or www.lakeerieswiming.com by Tuesday, June 11, 2019. Individual events $6.00; Relays $12.00; plus a $3.00 per swimmer surcharge. There is a $1.00/swimmer handling fee for entries not furnished in an electronic file. Make checks payable to LESD Boosters Club. Swimmers may enter an unlimited number of events, but may compete in no more than 3 individual events per day, inclusive of time trials. Swimmers must scratch down by the scratch deadline, and will not receive a refund for scratched events. Teams may enter 2 relays per relay event. Deck entries will be taken on a space available basis up to 40 minutes before the start of the session and seeded at NT. Deck entrants should sign up at the deck entry table @ $12.00 per individual event and $20.00 per relay. Swimmers new to the meet will be charged a $3.00 LESI surcharge & must supply proof of USA registration. Deck entries will be allowed to score. Deck entrants for whom there is no space will receive a refund at deck entry table. On deck USA Swimming registration will not be available for athletes or coaches. Swimmers must be current athlete members of USA Swimming and have met the time standard requirements. Coaches must be current coach members of USA Swimming and must check in on each day of the meet. All coaches must display the deck pass (wristband) issued by the meet host. Age is as of the first day of the meet, June 13, 2019. Please see the event listings. Swimmers must be equal to or faster than the cuts listed. Enter at either short course yards(Y) or long course meters (L) times.Converted times may not be used. Meet management will convert non-conforming times. All swimmers must have an actual time to enter an event-NT is not acceptable. Individual entries with NT will NOT be processed and space will not be saved. Swimmers should enter an event only if they have achieved the listed time standard for that event. Teams of swimmers who fail to achieve the qualifying time at the meet will receive a notice of those times that cannot be verified in the SWIMS database. Teams shall submit proof of time or a fine of $10.00 for each swim listed in the notice. Failure to resolve time verification issues within one week of receipt of notice shall result in debit to the team’s account in the amount of the fine. Unattached swimmers will receive similar notice. Time trials will be offered on Thursday evening following the 800 free relays prior to the fastest heat of the girls 1500. Swimmers who wish to swim a time trial on Thursday evening will be limited to events 400 meters and shorter. Sign up for Thursday time trials will close at 4:50 pm. Time trials will also be held at the conclusion of the morning and afternoon sessions on Friday, Saturday, and Sunday. Time trials count towards daily limitations. Swimmers must sign up in advance at the deck entry table at a cost of $12.00 per individual event and $20.00 per relay event. Only swimmers who are entered in an individual event in the meet may participate in time trials. Time trials entries will close 90 minutes prior to the end of each session on Friday, Saturday, & Sunday. Session 4: Friday Finals will be held after a 45-minute warm-up, timeline will be posted. Session 7: Saturday Finals will be held after a 45-minute warm-up, timeline will be posted. Session 10: Sunday Finals will be held after a 45-minute warm-up, timeline will be posted.